So the middle escalator at Wheaton Metro was finally working this morning…but one of the outside ones was shut down. Sign still says “Back in Service August 2011.” And tonight’s afternoon commute featured one blocked-off escalator (the one on the right side as you’re going up — didn’t they spend months fixing that one earlier this year? ), one running down…and the middle one not running, leaving most of us to trudge upward without mechanical assistance. A good workout, but still. Tragedy or farce? The managerial incompetence is astounding. I’m pretty sure Metro is trying to kill me. At least that’s one area where they might actually succeed for a change. Back to food-blogging someday soon I hope. The middle Wheaton Metro escalator is still under construction, still with signs saying “Back in Service August 2011” — I think maybe the maintenance crews are confused, because the signs also display Metro’s new slogan “Metr0 Forward” so maybe the repairs move forward one moment, and back the next? To me, that seems unlikely. Much more likely: they are building an escalator time machine that will whisk us back in time, to August 2011 or even earlier, perhaps to a time when Metro ran on time and escalators were not under permanent construction. If we’re lucky, we could go forward in time and enjoy those same features. Surely sometime in the future we will have a functional Metro system again? We have the time machine technology, and if it can be implemented in hot tubs, surely it can be implemented in escalators. This is the most plausible explanation I can think of. So surely this is what they’re doing. Surely the work isn’t just inexplicably, frustratingly slow and poorly communicated. Or maybe all the rain combined with the steamy humidity down at the Wheaton Metro platform is giving me hallucinations. Back in service August 2011: so say the recently-upgraded signs on the green plywood walls covering the not-yet-fully-upgraded middle Wheaton Metro escalator, under construction lo these many moons. We are running out of August! Sometimes these sort of Metro timetables have a way of lengthening. Also, as soon as they finish the middle one, I assume they will move on to the third and final escalator for major repairs that I’m sure will last into 2012. Which will happen first: all three Wheaton escalators running simultaneously, or demolition begins on the Wheaton Safeway? I figure, whether or not Metro meets its goal, at least this blog can get back in service by the end of August. The summer’s heat and humidity melted away my will to live blog, plus for some reason I haven’t been eating out as much lately (need to change that). Posting will likely not return to the nearly-daily level of the first half of 2011. But: we’re back, baby! Oopsie! Makes me feel better about my Metro commute this morning, involving offloading a crowded train at Judiciary Square. 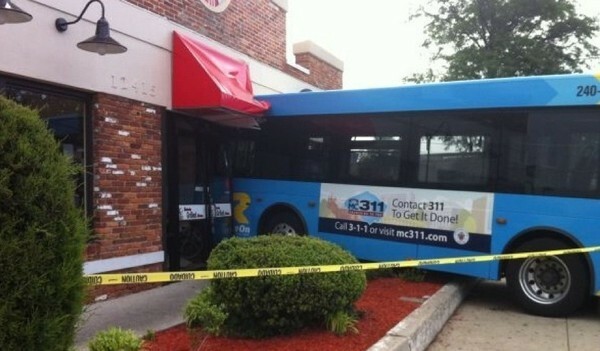 Maybe the RideOn driver had a sudden Double Down craving? Patch has the story. Shock and awe: all three Wheaton Metro escalators are running this morning, the new one is bright and shiny with yellow caution markings at the front of each step. Today will be a warm day in the DC area but it must be a cold day in hell. Wheaton’s third escalator has been out of service for months — six months maybe? — and until this week bore a sign saying it would re-open in February 2011. This week the sign was changed to March 2011. Any day now! But really the third escalator isn’t essential, except as a useful backup when one of the other two need maintenance. Metro’s failure to finish the work, though, is yet another symbol of the system’s dysfunction. Maybe we should just be glad our escalators aren’t collapsing, but that seems like an awfully low bar to clear. While Metro may be failing on maintenance, at least they are also failing on security. Consistency! Nice of the Guardian Angels to help, but bad that Metro can’t police itself. As the system deteriorates, so do the riders. Wheaton’s station is generally graffiti-free but got hit with a bunch about a month ago and two weeks passed before it was cleaned up. I’ve also noticed an increase in food and drink on the trains, including this morning, when a guy who got on in Glenmont finished his breakfast sandwich on the seat across from me and nonchalantly dropped the wrapper on the floor, then ground it into the carpet with his shoe while sipping his iced latte. I might have said something, but he wouldn’t have heard it because his iPod was turned up loud enough for the entire car to hear, and for him to hear nothing else. That’s not the worst food problem, though. The worst was yesterday afternoon, when someone got on at New York Avenue with fried chicken. Maybe they weren’t eating it on the train, maybe they were transporting it home, but the fried chicken aroma filled the car and lasted all the way to Wheaton, and it nearly killed me, taunting me all “I got fried chiiiiicken and you can’t haaaaave any.” Just cruel. So that’s the real reason not to bring food on the Metro: not to incite fried chicken riots. Because the Angels will come down hard on that (and then they will take all the chicken for themselves). UPDATE: because apparently there is some confusion, I will add that the last paragraph, about the chicken, is not meant to be taken seriously. One of Wheaton Metro’s three escalators (longest in the Western hemisphere!) has been boarded up and under reconstruction for months. This morning, the middle escalator was also blocked off, out of order. The third escalator was open but not running, so people could walk up and walk down, creating slow-moving and sometimes standstill foot traffic, especially going up, because many people had to stop and rest multiple times. Why were so many people walking up in the morning? Why not take the elevator? Because the elevator was also out of service. Of course it was. Stupid Metro.